Divers will speak the phrase “more fish than water” after an unforgettable liveaboard dive holiday among the rich waters of Papua New Guinea. Papua New Guinea liveaboard diving offers divers the exceptional chance to really get away from it all, as you explore the stunning array of remote wrecks and reefs of this undersea paradise. PNG, as it is often known, is made up of more than 600 volcanic, jungle-clad islands and scattered coral-fringed atolls amid the crystal waters of The Coral Triangle. Famed as a marine biodiversity hotspot, this area of the western Pacific Ocean is home to six of the world's seven marine turtle species, more than 2,000 species of colourful reef fish and an astounding number of vibrant corals. Sailing from Walindi, or Rabaul Harbor, some of our liveaboards will take you to the unique dive sites scattered around New Britain Island. Dive cruises along the northern coast take in some of the incredible dive sites of Kimbe Bay, Witu Islands and Father's Reefs in search of tropical fish and tiny invertebrates in the coral gardens set among the black volcanic sand, or to swim with the likes of barracudas, and silvertip and grey reef sharks circling the seamounts that dramatically rise almost to the surface out of the ocean depths. On most days you are likely to be the only divers around. As the seasons change, and along with them the weather and diving conditions, some liveaboards relocate their dive tours to check out the ocean delights of the reefs that fringe the idyllic white sand beaches of New Britain's southern coast, not to mention the possibility of a dugong siting The small town of Alotau, at the southeastern tip of mainland Papua New Guinea, is the jumping off point for our liveaboards to discover the huge variety of wonders of Milne Bay. World War II wrecks, coral-wrapped walls where the lucky are sometimes visited by Mantas, and muck diving for seahorses and bizarre critters, is enough to keep even the most seasoned diver happy for longer than your PNG trip lasts. Papua New Guinea diving is considered by many as a true underwater photographer's paradise, and liveaboards give divers the opportunity to check out a wonderful taster of remote reefs, coral walls, deep seamounts, and a variety of WWII wreck sites in comfort and safety. 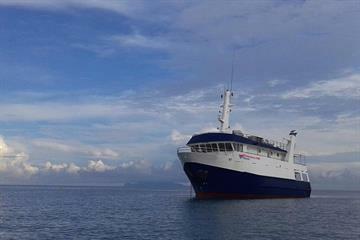 LiveAboard.com hosts distinct dive cruise experiences in Papua New Guinea, exploring either the varied locations around New Britain Island or diving the magnificent range of sites in Milne Bay. 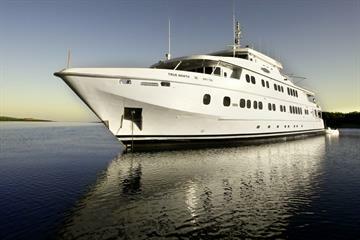 Both our liveaboards are on smaller, boutique motor yachts, 20-22m (66-73ft) in length, which caters to only 10 or 12 guests. Most of the diving tours last between 9 or 10 nights, although there are some shorter trips available during the winter months (July and August). Don't let old stories of head shrinking and cannibalism scare you away from the spectacular diving that PNG has to offer. Throughout your PNG diving adventure, you will get to meet the friendly locals who paddle out in their outrigger canoes to trade fresh fruits and veg to visiting boats. If you want some more time with the natives, two itineraries aboard the MV Febrina in July also offer the chance to combine your dive liveaboard with the Rabaul Mask Festival, where you'll be entertained with traditional Papuan - Melanesian singing, dancing and elaborate bilas (traditional costumes). New Britain Island is the largest island in Papua New Guinea's Bismarck Archipelago, offering liveaboards a multitude of varied dive sites, from the reef walls that drop off into the abyss and the towering seamounts of the north, to the mangroves, lagoons and barrier reefs along the southern coast. Kimbe Bay, on the northwestern coast of New Britain, is surrounded by sleeping volcanoes. With quintessentially colourful corals and close to a thousand species of fish, the dozens of little islands and hundreds of submerged reefs make this one of those dive venues that most divers have on their bucket list. Witu Islands were formed thousands of years ago by undersea volcanoes breaking through the surface of the ocean. Sitting to the northwest of Kimbe Bay, the black sand islands, surrounded by deep ocean depths, are ideal for diving by day or by night. Fathers Reefs is a chain of offshore reefs to the northeast of the Kimbe Bay, surrounded by the deep blue waters of the Pacific Ocean. It’s distant location mean pristine reefs with dramatic formations that seem to attract a lot of pelagic activity. Milne Bay sits as far southeast as you can go on the PNG mainland. Below the surface of this sheltered, deep-water bay, caught between the Coral and Solomon Seas, are plankton rich waters hosting a myriad of sea creatures, as well as a variety of wrecks that contest to the area's strategic importance during the Second World War. May to November are the most popular months for diving in PNG, but with a warm to hot and humid climate throughout the year and water temperatures ranging from 24-29 degrees Celsius (75-84 Fahrenheit), there is no bad time to dive Papua New Guinea, and little need for much neoprene. Most likely due to being out in the middle of the Pacific Ocean, the visibility throughout the local liveaboard diving is generally excellent, but can range from 15 - 45 meters (50 - 150 feet) depending on when and where you are. Pack light if you are flying on smaller flights within Papua New Guinea to the port of departure of your liveaboard, as baggage allowance on domestic flights in PNG can be as little as 10-16kg (22-35lbs) for a checked bag. Remember to pack your most important dive gear in your carry on bag, such as your dive computer and regulator, and if you have a DIN reg, it's best to take your own adaptor just to be sure. Electricity is 240V/50hz like in Australia and New Zealand and plugs are also like theirs, but some liveaboard boats are fitted with both 110V and 220V outlets for recharging batteries on board. If in doubt bring a travel adaptor or two, to keep all your diving gadgets charged up for that whaleshark or hammerhead encounter. Papua New Guinea is 10 hours ahead of Greenwich Mean Time (GMT) or 14 hours ahead of Eastern Standard Time in the United States, and they do not set their clocks forward and back for daylight savings (it's not observed). Although English is spoken in Papua New Guinea, the locals speak more than 800 languages, in addition to many minor dialects. The most common tongue you'll hear during your trip is pidgin (Tok Pisin), so it can be handy to learn a few basic words or phrases, if nothing else, as a sign of respect. The local money is the PNG Kina. You'll be able to change money when you arrive at Jackson's International Airport when you arrive, where they'll have the exchange rate listed. A lot of places, including some liveaboards, will also accept travellers' cheques and international credit cards, but check with the boat you are cruising on. Be aware that there is a 10% tax charged at hotels, restaurants and bars, but it is usually already included in published prices. Jackson's International Airport, just outside Port Moresby, is the official gateway into Papua New Guinea and is also where you'll hop aboard your puddle jumper, domestic flight to either New Britain, Alotau or Rabaul, to climb aboard your liveaboard. The island of New Britain is just a 90-minute flight from Port Moresby, and then you'll have a 45-minute drive from the airport in Hoskins to the picturesque and intimate Walindi Plantation Resort on the shores of Kimbe Bay to begin your liveaboard diving adventure. For diving cruises of Milne Bay, your departure point is the provincial capital, Alotau, built on the hillsides of the northern shore. The good news is that it’s only a short 50-minute hop on the local flights from Port Moresby to this prospering market town, where many boats of all kinds depart from colourful Sanderson Harbour. 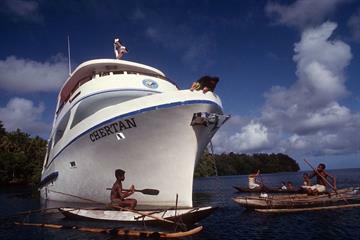 A few of the Papua New Guinea diving liveaboards set sail from Rabaul, on the northeast tip of New Britain. An hour and a half flight, followed by a 60-minute drive, with stunning views out over the Pacific, will bring you to the bay that was formed naturally thousands of years ago when the cone of a volcano partially collapsed into the sea. On some nights you will be able to see the glowing lava of active volcanoes in the distance. A Papua New Guinea liveaboard trip may not be for the most budget-minded diver - ranging in price from US$295-$405 per person/day - but the incredible variety of diving environments, abundance of pristine corals and sea life both big and small, mean it is more than worth every penny and should be among all our "must see" dive destinations. Divers will be asked to pay environmental reef and hyperbaric chamber fees, but you should check with each liveaboard boat whether this is payable in advance or on arrival. The diving is accessible to all levels of certified divers from Open Water upwards (there's no minimum number of logged dives required), but to get the most out of your Papua New Guinea diving experience, an Advanced Open Water certification is recommend, so that you'll feel completely comfortable at all the dive sites. In general, you won't need any vaccinations for your trip, but Malaria is around, so it's definitely worth packing some strong insect repellent, especially if you plan to combine your diving liveaboard with exploring some of the islands. It's always best to check with your doctor before you travel for their up-to-date recommendations on vaccinations or other preventative measures, and don't forget your medical certification card if you are travelling from a country that has yellow fever or cholera. Excellent overall experience with intersection of the undersea environment with PNG village folk above the water. The best possible reef and macro diving without the presence (and influence) of industrialized dive operations. Kind of hard to get there, but once you are on the boat you should be prepared for an amazing mix of small and big creatures in the water and excellent land trips to volcanoes and WWII sites.